Sometimes, creating an attractive email signature is essential. It is necessary for your business when you represent a company, offer your services or goods. A professional signature helps you to interest the readers, helping them contact you fast and easily, show your personality, looking friendly and polite. Therefore, you would need the best HTML signature that is properly formatted and includes your logo or slogan. Meanwhile, it’s not so easy to build a good signature for your company. The reason is that multiple operating systems and email clients exist nowadays. Each of them interprets the available HTML code in a different way. Therefore, your signature is to be responsive that is mobile-friendly, cross-platform, compatible, to be represented on the screen accurately and correctly. So let’s check how to create HTML email signature that is properly designed, attractive and informative. What is an HTML Signature? An HTML (Hyper Text Markup Language) signature is a piece of text that is appearing on the bottom of your online message. It is different from the simple and common, plain text by an ability to display images in different sizes, colours and shapes, add tracking links, lines or dots other design elements. In the past, you probably had to be an experienced coder, an email signature designer or developer to create an HTML signature. Old methods implied building multiple HTML tables with multiple rows and columns, writing long and complex codes, to create an email footer or disclaimer with a complicated layout. The CSS (cascade style sheets) language knowledge was also necessary, as these elements were helpful in positioning the text and representing graphic elements in the web pages and messages. The authors had to set the right columns width and height to make sure, the target email client surmises the dimensions properly. Check an eye-catching HTML signature example to realize that the signature can be not boring, but eye-catching, elegant and recognizable. Nowadays, creation of HTML signature is fast and amazingly simple. It takes only several minutes and no efforts at all. 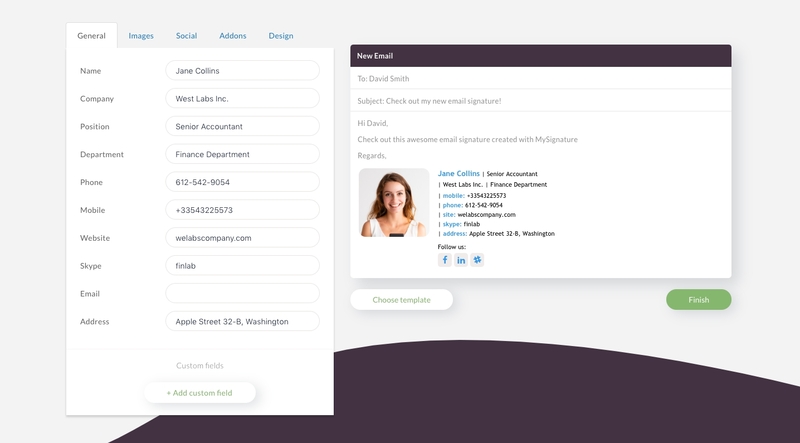 Just use an advanced and efficient HTML email signature generator, and be sure that your message signature is unique, compatible with all available platforms and properly represented. Modern services help you to add an informative and well-designed signature easily and focus on your key business without wasting any second of your cherished time. 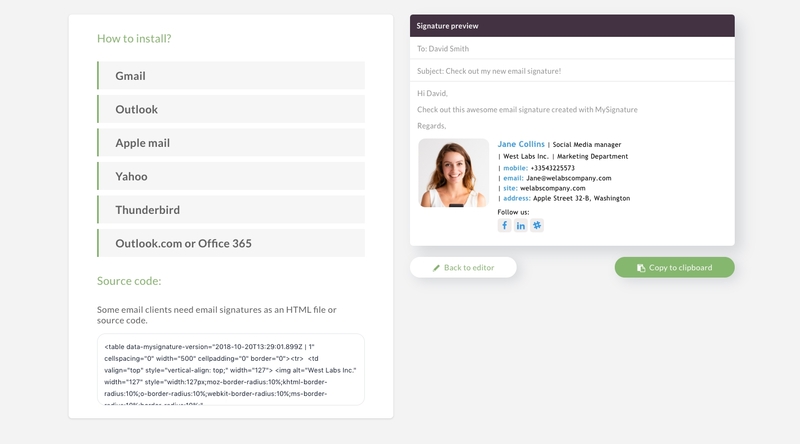 Find a reliable, safe and free HTML email signature creator, like MySignature, go to the service website and log in. Free options may be not sufficient to add the necessary images, but they are quite good for the initial presentation. Click the button to initiate the signature generation. Fill in the form, adding the necessary contact details such as your position, official name, addresses and phone numbers. Clicking the “Social” tab, select the social media kinds you use heavily and need to add to the contacts. Edit each social media details, changing the URL. Proceeding to the design, select the corresponding tab and select the suitable HTML signature template. Some free HTML footer templates are available in our free editor. 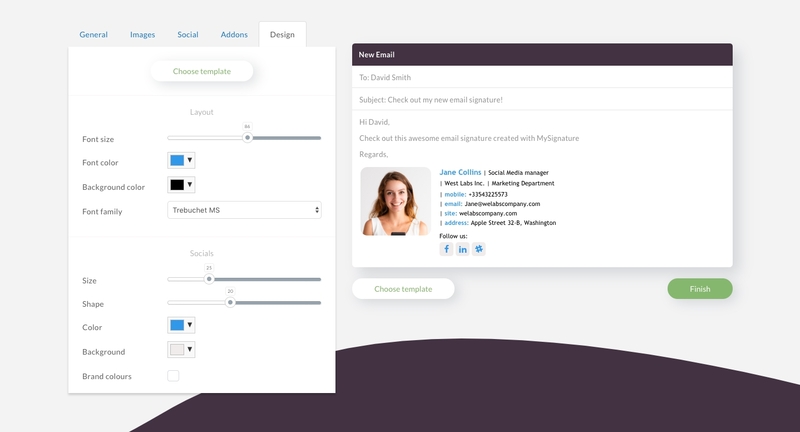 However, in the premium editor, you can find a bigger variety of signature templates, different icons and design tools. However, you can proceed with the limited version for now and click the “Finish” button to preview the signature. If everything is ok, click the “Copy to clipboard” button or select the HTML code of the signature you previewed to proceed with the installation. As you see, not only the coders can manage the important task, making use of professional services. Note: check installation guide for your email client before installation. 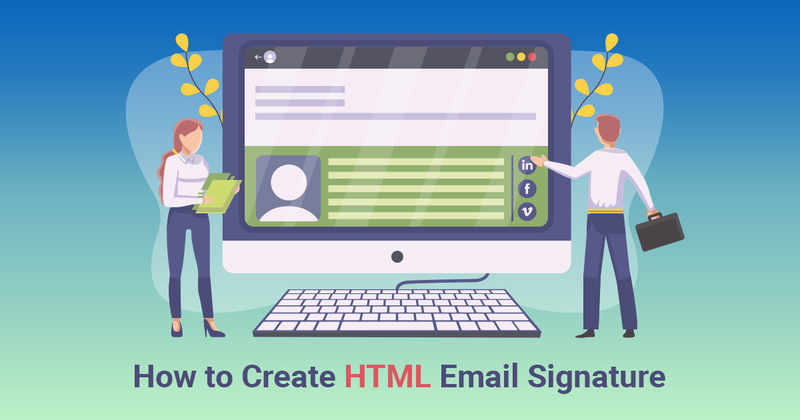 Quite naturally, the mail signature HTML template is to be personalized, targeting the right person and the device that is used to read the message. 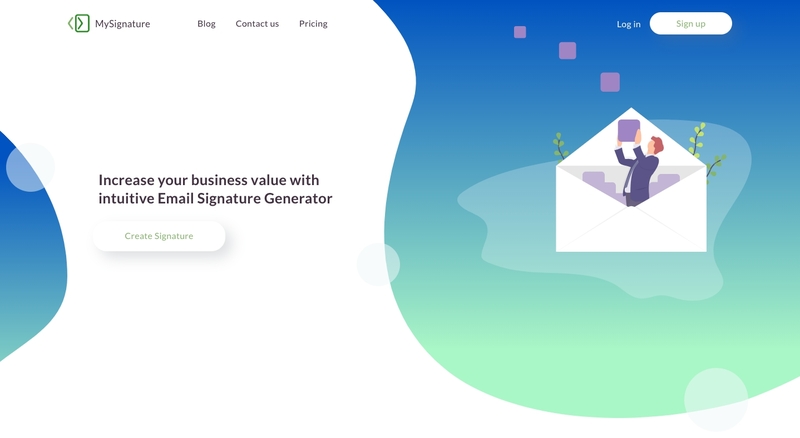 Professional and elegant HTML email signature design helps to make a positive impression on the recipient, optimizing its connectivity. A promotional banner or some marketing tools can be added, being showed not as attachments, but as the message part. The signature creation takes only about 5 minutes of your precious time, and the result will be just perfect! Next PostNext Why getting an email signature is vital for your business?